Use Schedule MD™ to analyze P6 (.xer) and NetPoint files to improve results. 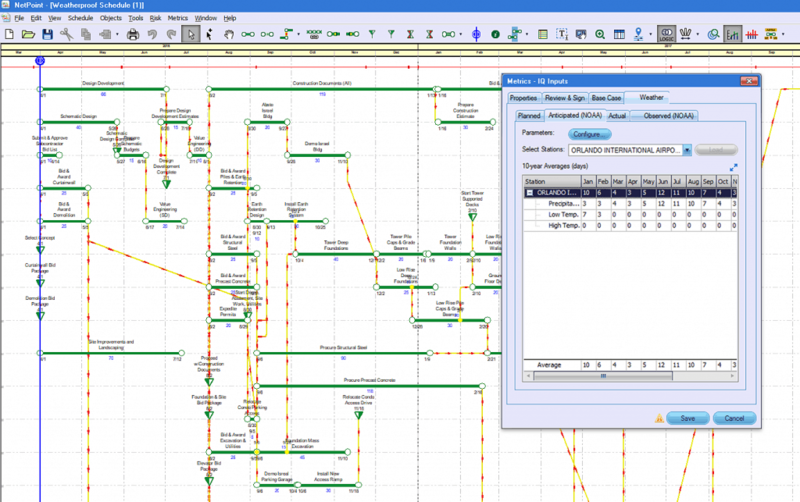 Schedule MD™ is a module for NetPoint® that allows project planners and schedulers to develop and analyze schedules for a more reliable result. 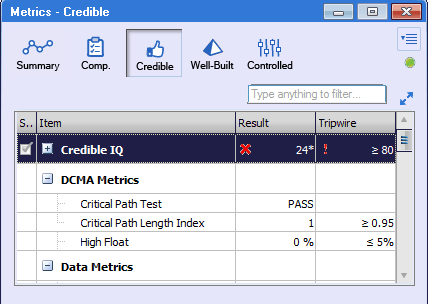 This includes Schedule IQ™ that scores the reliability of your schedule based on compliance with PMA’s Core Traits of a Reliable Schedule protocol and provides other metrics according to the DCMA 14-Point Assessment. The metrics and score helps project planners identify and repair the weakest parts of their schedules, resulting in more reliable overall scores. Download PMA’s Core Traits of a Reliable Schedule protocol. 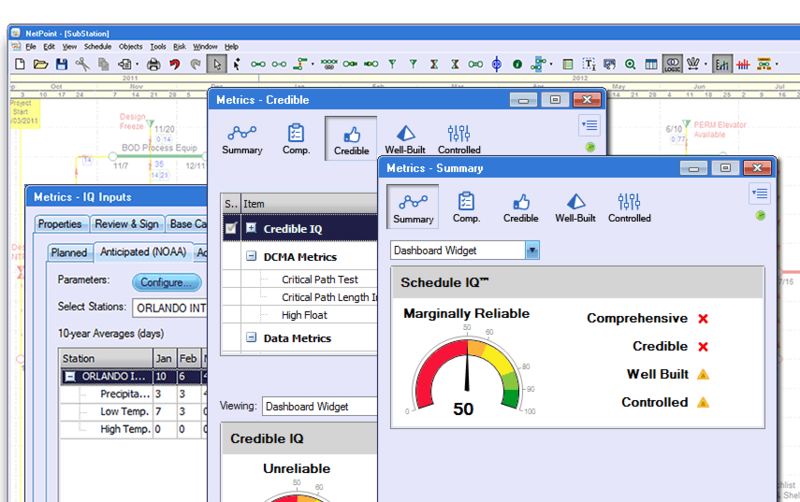 The Schedule IQ™ Score is the most comprehensive schedule reliability rating system on the market. It is based on 42 individual metrics derived from the industry-leading Core Traits of a Reliable Schedule. Scores are reported from 0 to 100 and provided for the overall schedule as well as for four categories: comprehensive, credible, well-built, and controlled. As a result, reliability can be assessed at both macro and micro levels. How is the Schedule IQ™ Score Calculated? The Schedule IQ™ Score considers logic, constraints, float, the critical path, relationships, durations, progress, forensics, resources, WBS assignments, risk, weather, earned value, and calendars. IQ scores adjusts internally based on the progress and level of your schedule. For example, the logic index for a level 2 schedule should be lower than that for a level 3 schedule, and Schedule MD™ accounts for that. Define thresholds for critical activities. Metrics libraries offer over 150 metrics including the 14-Point Assessment metrics by the Defense Contract Management Agency (DCMA). All together, they cover areas including logic, constraints, float, the critical path, relationships, durations, progress, forensics, resources, WBS assignments, risk, weather, earned value, calendars, and many more. View dashboard widgets, find matching activities and deficiencies, and export a DCMA report to Excel. Thresholds and definitions come pre-defined making it easy to start analyzing and interpreting results. Launch the Metrics Manager™ from within NetPoint to see where activities are in the network and how modifications to the schedule affect metrics in real-time. Reporting is a fundamental feature of the Metrics Manager™ and an integral part of any metrics analysis. All table-based data can be customized and exported to Excel, making it easy to export any detail desired. Plus, a set of predefined executive reports is included for summarizing results and communicating the big picture. Drag and drop to add, remove, and rearrange columns; query any text field using universal search; and enlarge any table to make metrics data easier to work with. Choose from four print-friendly, pre-formatted Excel reports for summarizing metrics and IQ data, including the Summary Report, the IQ Report, the DCMA Report, and the Deficiency Report. View activities by the number of metrics they are violating, organized as a tornado diagram from highest to lowest, making it easy to focus on the most problematic activities. 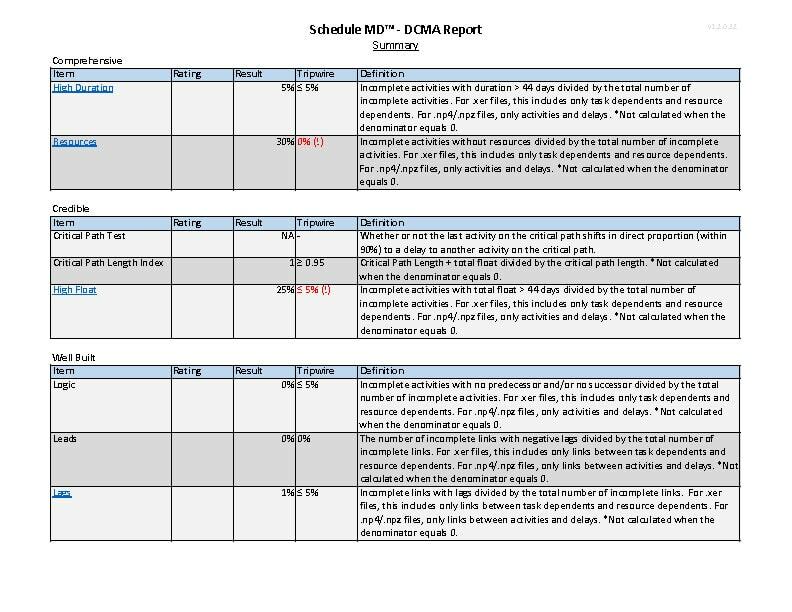 The Metrics Manager™ includes a number of tools for reviewing schedule submittals, including checklists for verifying that the narrative document conforms to best practices and scores accordingly. It also provides the ability to record and document stakeholder approval, making schedule sign-offs more transparent. Unique checklists tailored to unprogressed baselines, revised baselines, and updates, including up to 47 checks spread across 8 categories. 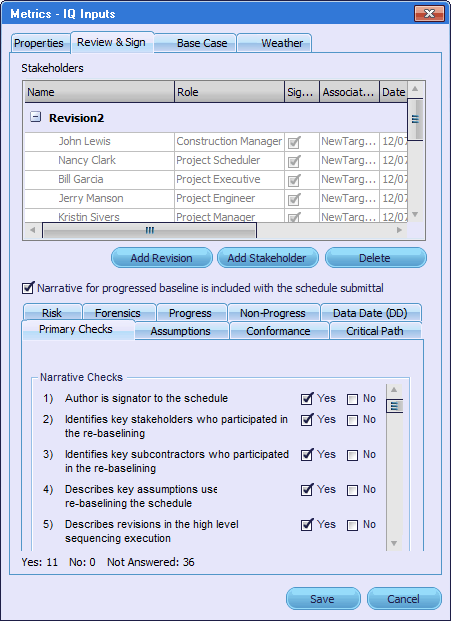 Stakeholder names and roles, as well as comments on signatures are linked to targets, making it easy to see which version of the schedule stakeholders have signed-off on. The Metrics Manager™ includes a one-of-a-kind feature-set for planning and analyzing normal and actual weather. NOAA integration makes it easy to find and download global historical weather data, and key metrics allow you to evaluate how weather has been accounted for in your schedules. View average monthly weather data for temperature, precipitation, and wind for thousands of weather stations across the world. Download actual observed weather on a monthly basis for weather submittals or forensic analysis.